JOHNSON COUNTY—It was a time to play. It was a time to pray. But just as important, the fourth annual Bishop Bruté Days from June 10-13 at the Future Farmers of America Leadership Center just outside Trafalgar was an opportunity for 58 junior and senior high-school-aged boys to be among peers who are open to the idea that God might be calling them to the priesthood. “It shows me that I’m not alone in this world, that others want to do this [consider a vocation to the priesthood],” explained Nick Porter, 15, who will be a freshman at Cardinal Ritter Jr./Sr. High School in Indianapolis this fall. A member of St. Christopher Parish in Indianapolis, Nick said he became interested in the priesthood in the fourth grade. At the camp, he especially enjoyed eucharistic adoration, Mass and listening to presentations by priests. “I love to hear different talks about Christ and his life with the Church,” Nick said. 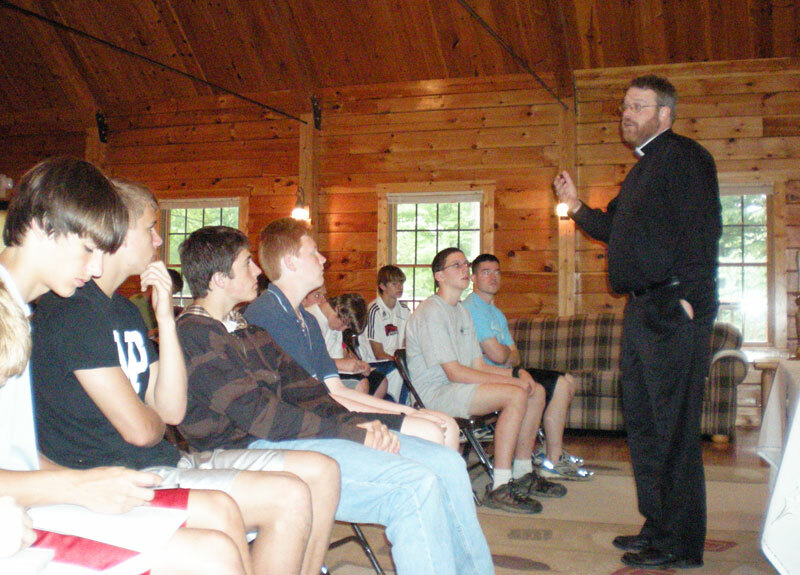 The camp was sponsored by the Bishop Simon Bruté College Seminary in Indianapolis and, as in years past, archdiocesan priests were there throughout the week, giving presentations on the faith, celebrating Mass, hearing confessions and presiding during Benediction. Members of the Knights of Columbus and the Indianapolis Serra Club provided meals for the campers. Seminarians like Martin Rodriguez served as camp counselors and mentored the teenagers while leading them in morning and evening prayer services. They also took part in outdoor activities like canoeing, and offered advice as the campers tackled an obstacle course and played games like dodgeball. Seeing the teens offered a “good refresher” on how God worked in his life, added Rodriguez, who just completed coursework at Bishop Bruté Seminary and will go to Rome in July to continue his priestly studies at the Pontifical North American College. Father Robert Robeson, rector of Bishop Bruté Seminary, said he believes there is a growing interest among teenage boys in the possibility of priesthood. But having an interest is only a starting point, he said. Campers weren’t limited to young men from Indianapolis deanery parishes. Anthony and Nick Ohlhaut, 15, are members of St. Teresa Benedicta of the Cross Parish in Bright. The twin brothers made the road trip to Johnson County with their brother, Ben, 13, and fellow parishioner Aaron Badinghaus, 16, after Father Thomas Kovatch, their parish’s administrator, encouraged them to attend Bishop Bruté Days. “It’s cool seeing all these Catholics here [our age] thinking about the priesthood, too,” Nick said. Derrick Roll, 14, a member of St. Michael Parish in Bradford, came back to the retreat and camp-like atmosphere for a second straight year to continue discerning whether a calling to the priesthood is in his future. He said his parents, especially his father, have been very supportive. While family can play a key role in helping young people discern their vocation, being around like-minded teens can also be a positive thing, Father Robeson said.